Daniel promoted Imperium on CBS This Morning today. 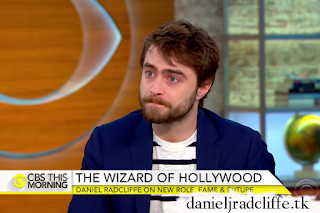 He also mentioned The Simpsons (his first role as Edmund) and again (ofcourse) he was asked if he will go and see the Harry Potter play Harry Potter and the Cursed Child. Update: 16th August 2016. After the show TMZ Sports asked Daniel about Fantasy Football while he was signing autographs outside.